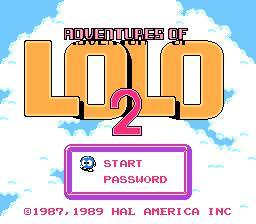 Adventures of Lolo 2 is a puzzle game released in 1990 by HAL America for the NES/Famicom. It is based on the Japanese Eggerland video game series. 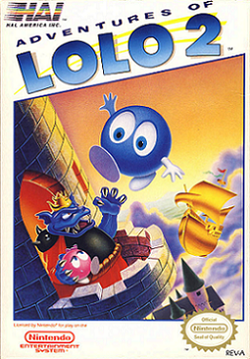 It was the second Lolo game developed and released in the USA, the fourth one released in Europe, but it was never released in Japan. It is a compilation of stages from three Japan-exclusive games (it re-uses the same graphics, music, and cutscenes from Adventures of Lolo (Japan), but only 10 puzzles out of 54 are the same). Adventures of Lolo 2 was released on the Wii Virtual Console on January 21, 2008. Contains 54 rooms: 9 floors with 5 rooms each in the tower, a castle containing 5 rooms (that works as the 10th floor), and 4 "Pro" rooms available by entering specific passwords (PROA, PROB, PROC and PROD). The gameplay is virtually identical to the previous games. Differences include new puzzles and greater difficulty than Adventures of Lolo. The game features a total of 54 different puzzle rooms, plus an actual fight with King Egger at the end. It was not really a popular sequel to Adventures of Lolo, as very few improvements were made to gameplay. In fact, both Adventures of Lolo 1 & 2 are essentially compilations of stages from the 3rd and 4th Eggerland games (see: Adventures of Lolo 2/Original rooms). Some innovations introduced in Adventures of Lolo (Japan) are re-used in this game: some of the monster graphics, mainly Gol, Rocky, Skull, Medusa and Don Medusa; the last five rooms take place in the castle in the sky, which actually has a different tileset than the regular tower; Lolo can actually fight against Egger himself; the four hidden Pro puzzle rooms are available for players who want to try very challenging rooms. Our heroic pair are at it again! On their return from the Haunted Castle (successfully defeated in the previous Adventures of Lolo) our Hero and Heroine were confronted by the real power of the land: the King of Eggerland himself. Swooping down on our victorious couple, the King thundered "The Labyrinth was only a preliminary test: the real battle starts now! If you can make it through my Tower and my Castle, I will set your people free. But just to make sure there are no tricks, the little one comes with me!" And with that, he grabbed little Lala and spirited her away to his Castle in the clouds. Fortunately, Lala was able to analyze each of the mazes as she was taken through the Tower, and left clues in the Jewel Boxes in each room. each Jewel that Lolo collects contains a bit of information that will help him in the next room. With your help, they will work together to free their people from the clutches of the King. Titles disambiguation: The Japanese game Adventures of Lolo (Japan) contains mostly different rooms and some different challenges than the Western game The Adventures of Lolo 2. As such, many fans consider the Japanese version to be quite a bit more difficult than the Western version. They are actually two different games: the Japanese one includes original rooms, whereas the American one is a compilation of stages from previous Japanese games. This page was last edited on 28 December 2017, at 11:20.